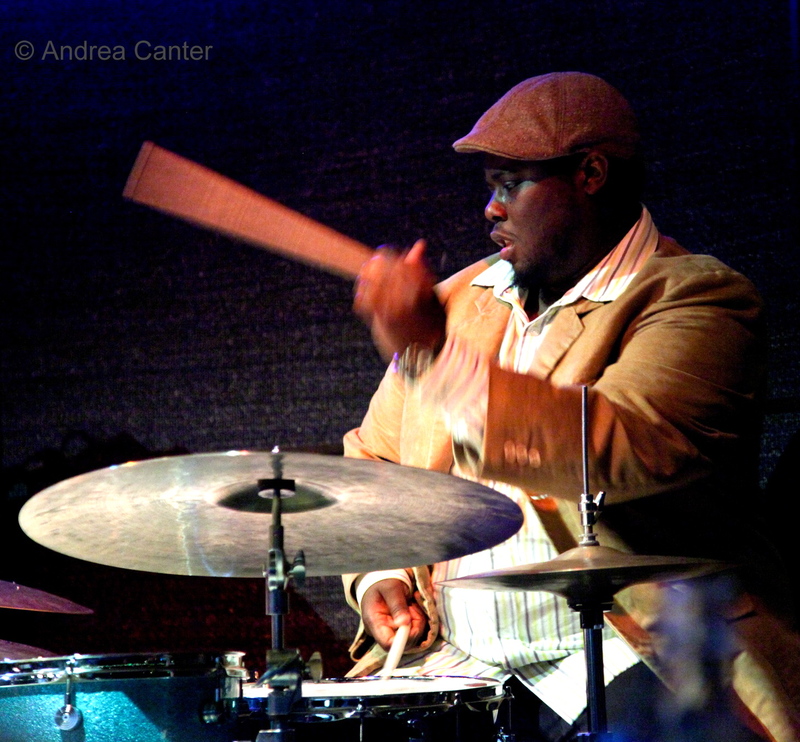 Johnathan Blake is a grammy-nominated drummer and composer, who regularly works with musicians such as Tom Harrell, Oliver Lake, and Russell Malone, as well as with his own group. 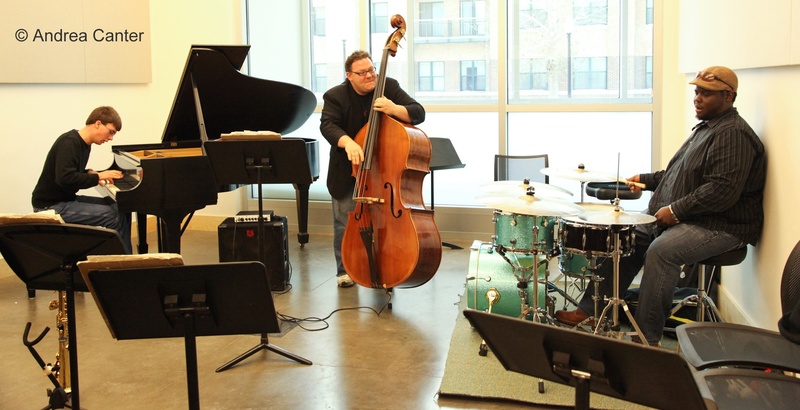 He came to town to work with the Dakota Combo, a group of high school students in a program co-sponsored by The Dakota Foundation for Jazz Education and The MacPhail Center for Music. This year, the combo is working on the music of Charles Mingus. Given that Blake spent ten year’s as the drummer for the Mingus Big Band, he was brought in to work with the combo. Blake appeared on Rhythm and Grooves the snowy morning of December 4, before heading out to a workshop with the combo and other students, and an evening performance with the combo at The Dakota Jazz Club and Restaurant in Minneapolis. This is a lightly edited version of our discussion that morning. LE: You arrived in spite of the snow. JB: In spite of the snow. Got in just before it started. LE: Let’s explain to the audience a bit of your background and how you’ve come here to work with the Dakota Jazz Combo. JB: Sure. I guess I was exposed to music even before I was born. My father was a jazz musician. A jazz violinist named John Blake. When I was born, he was actually performing regularly with Grover Washington, Jr. He stayed with him for about three years from 1976 until 1979. In ’79 he was asked to join the McCoy Tyner group and he stayed with McCoy for about five years. So I was really exposed to it at a young age, which was amazing. My father, being a traveling musician, when times allowed, would take me with him. So I was able to meet a lot of musicians at a young age, like McCoy, and a great saxophonist Joe Ford, even in Grover’s band at the time was Tyrone Brown a great bassist who went on to work with Max Roach, Sid Simmons, and Pete Vincent, the drummer. So it was great to be around those musicians at a young age. It really made a lasting impact on me. LE: I’m sure. And so you got into the music and became a jazz drummer. I noticed that in the last few years you went back and got a graduate degree. JB: I did, I did. I went to William Patterson for my undergrad work. Actually, while in school I was performing a lot. I was asked to join the Mingus Band in 1998 and stayed with them for about ten years. And so I started that and when I graduated, took some time off to tour. Then, my wife was pregnant with our first child. I thought I should take some time off to be with my wife and watch my kid grow. I thought back to when my father was in the same situation – he said, “I really have to be around for my kids.” So I knew that if I was going to be taking off from working I still had to make a living and provide for my family. I went back to school and got a full scholarship to Rutgers University. They also have a fellowship that gives you a stipend, because they realize you’re going to be taking time off from work. I went back, and really wanted to focus on composition and writing. I studied composition with Stanley Cowell, who’s a great composer and arranger and also with Conrad Herwig. It was 07 when I graduated. I started in 05. JB: Yeah, that’s where I met Adam. I think we came in the same year, 1985. JB: Oliver and I have known each other for a long time. He and my father played together for many years. In the big band there was also a great saxophonist named John Stubblefield. Stubblefield heard me playing and recommended me to Sue Mingus. So the next thing I know, I’m getting a phone call from Sue, asking me to come down and participate with the band. I was in awe. I was a young kid – 19 or 20. This was a big responsibility but I really wanted to step up to the plate. LE: And at that age you really don’t have very much fear. JB: No, I don’t think you do. You go into it blindly and learn as you go. LE: I was fortunate enough to see the big band about six weeks ago, and what I noticed was that Ta Cumba Frank Lacy was doing a lot of directing. LE: What is it about the music of Mingus that is so inviting and so challenging at the same time? JB: I think: one, it’s very open. There’s a lot of freedom in his music and a lot of freedom to explore, which is great for musicians in general. Jazz musicians are taught to be creative, and look at a piece of paper and take what’s on that paper and run with it. I think that Mingus’s music has a lot of that element built into it. It’s like nothing is wrong, so you really feel the freedom. Also, I think the challenge with his music is that there are a lot of intricate parts, where you really have to learn how to blend with a section. There are lots of dissonant harmonies that might not be familiar to the untrained ear. There are a lot of delicate things that you have to watch out for. You know, I learned a lot from being in that band. For me, as a drummer, I learned that it’s my responsibility to drive that band. That’s a hard job, to drive fourteen people (chuckles). It’s a big weight, but you really have to learn how to do that and grow. LE: I understand that from here, you are going to have lunch with members of the Dakota Jazz Combo, and then you’ll conduct a workshop for them and other young musicians. The combo has been studying the music of Mingus since the beginning of the school year. Adam Linz received an NEA grant to promote the study of Mingus’ music and perform some concerts. So what kinds of things will you be looking for in working with the young people? JB: Well, we had a little rehearsal yesterday, which was great. It was really amazing to hear some of these kids. They’re so much further along than I was at their age (chuckles). It’s amazing. This young pianist Quentin is really amazing – just his writing, and his playing. He has such great imagination on his instrument. So basically what I look for and try to convey to the students is about blending in a section, and working together. I was mentioning to them yesterday, when we play this music, or any kind of music, the main thing is to use our ears and listen. Not to try to outdo one another, but to play together. I was telling them there is no “I” in band, and to come together as a unit, and really listen, thinking “how can I make this performance better.” I want to instill that into them and work with them more. LE: Now, the workshop is this afternoon and it’s open to any youngsters that want to come by at 2:30 at MacPhail Center for music. And tonight at 6 o’clock you’ll be at the Dakota Jazz Club and Restaurant with them. Will you be playing with them? JB: Yes I will. They’ll be playing a bunch of Mingus songs, and I was invited to come and play some of the music. LE: Will you be replacing their drummer, or will there be two drummers? JB: Emerson, their drummer, will play a few tunes, and then I’ll play a few tunes. LE: You will be performing with the Dakota Jazz Combo this evening at six o’clock at the Dakota. You will also be conducting a jazz workshop for any high school students that are interested at MacPhail at two-thirty. And you are currently playing in at least three different kinds of groups, a trio, a quartet, and a quintet. You just had an album come out with the Oliver Lake Organ Quartet. How does the role of the drummer differ in each of those configurations? JB: I think it’s really based on the individuals writing. A lot of Oliver’s music is somewhat similar to Mingus’ in that he has a lot of inner textures, and a lot of different tempo changes. He’s one of the only people I know that, for the drummer, writes out specific charts. JB: Which is really amazing because I don’t get to see that. It’s usually a lead sheet or a piano sheet. So it’s really amazing. You really have to be aware of what he wants. There are specific snare drum hits that he needs to hear. So my role in that is trying to take what he’s written and make it my own. So it does have specific things that are written that I have to play. I play in a few different trios. There’s one with a great saxophonist, Donny McCaslin, and also with Kenny Barron’s trio. With Donny’s music, it’s kind of intricate. He really has a lot of different things like metric modulations and things. I think you really have to be aware of what’s going on there. He has some vast dynamic changes. With Kenny, Kenny’s music is really based in the bebop tradition. The thing that I really admire about someone like Kenny Barron, is even though his heart is in bebop, he’s really an open-minded individual. And he really wants the drummer to play not just what Philly Joe Jones would play, or Max Roach. He really wants the drummer to be experimental and really play the more modern things so he can pick up and that and play to what you’re doing. It’s really amazing that he allows the drummer to have that much freedom to do that. I’ve learned a lot from being in that band with him for the last two years. LE: That is an important part of the jazz tradition – younger musicians play with older players and learn from them. JB: Totally, totally. I think that about 75% of what I know now is through being on the road with older musicians. Now, for the past five years, I’ve been fortunate enough to play with the great Tom Harrell. Tom is just amazing person in general. He’s diagnosed with paranoid schizophrenia and for anyone who doesn’t know, that disease can really limit a lot people. He marvels not only musicians – fellow musicians, but also doctors, because they can’t understand how a person with his condition can travel, and be in front of an audience and play, just play beautifully. Not only that, he just writes such great music. I watch him sometimes when we’re on a plane. He writes anywhere. He has these little notebooks that he takes out and just writes. It’s very inspiring for me to be around somebody like that. He doesn’t really say very much. He just wants you to take what he’s written down and make it your own. Maybe he’ll say, maybe you could try this, but it’s really up to the individual. I think he puts all his trust into the musicians that he hires. I can’t say enough about him; he’s just a beautiful person. LE: That’s great. If somebody wanted to know more about you and where you’re appearing, do you have a website? JB: I do. It’s Jonathonblake.com. It has an up to date schedule and everything. I have a recording coming out and it talks about that. LE: When is that expected? JB: the second week in January. LE: And who do you have playing with you? LE: Well, I look forward to hearing that when it comes out. Thank you very kindly for stopping by and taking time out of your schedule while you’re here. It’s great. This entry was posted on Tuesday, January 25th, 2011 at 3:31 pm and is filed under Interviews. You can follow any responses to this entry through the RSS 2.0 feed. You can leave a response, or trackback from your own site.